All About Art: How much Paul N. Norton worth? This Art blog is about helpful artwork tips and techniques and covers topics such as: what are the standard canvas sizes, art prints, printmaking, acrylic paint, art history, art styles - impressionism, abstract, modern... You will find examples of many original Oil and Acrylic paintings, Photography, Pastel Drawing and more. Some posts will cover specific artist and their artwork e.g. Paul N Norton. How much Paul N. Norton worth? Well the first question is who is Paul N. Norton? "Paul N. Norton (February 15, 1909 in Moline, Illinois – 1984) was an American artist. The son of a railway clerk, Norton painted more than 500 watercolors in his career, and also created many memorable logos for companies such as Dairy Queen, Pella Windows, and others. His paintings can be found hanging in the White House, U.S. Capitol, the Iowa Governor's Mansion, and Tahoma Vista Village among others." Recently it seems there is a spike in number of people trying to figure out how much Paul N. Norton's artworks worth. And there seems to be a lot of art prints floating around. As with any art it is only worth what people are willing to pay for it, but I did some research and here is what I found out. Disclaimer: This is a guideline and personal opinion only – this is not a proof or solid fact, so use it wisely. High quality art print on watercolor paper can range from $50.00 to $500.00. The price is based on how rare the print is and this is including the frame. I have not yet come across artwork that is not a watercolor so I would say as long as it is a watercolor it and it is an original it can probably go as high as $5000.00. Limited edition prints will fetch more, but again I haven't seen or heard about any of them. However, there are many high quality prints on watercolor paper and the most common question is "Do I have an original or a copy". Most of the prints have brown protective paper glued to the back, but an easy way to determine if it is an original or a print is to use a magnifying glass. If you see dots it is not an original. Watercolor paint is absorbed by the paper and sometimes even 'bleeds' through it if a lot is used, so dots or sharp end at the edges is a good indication that you are dealing with a high quality print rather than original. Please do not e-mail or call me to find out how much your Paul N. Norton art worth. You can post a comment here and I'll reply. If you have sold an original or art print please share you experience here – solid figures are appreciated. There are a lot of great information accumulated in the comments over the years. If you read them all you'll probably find your answer. In the end the best advice is – contact your local art gallery and they should be able to give you an estimate, if not then you are working with the wrong gallery. My Paul N. Norton watercolor print for sale. My boyfriend and I were browsing through goodwill when we stumbled across a beautiful watercolor and so we bought it for $6.99 and then we researched the artist (Paul N. Norton) and then took the watercolor to a local art store and the lady told us it was definitely an original. It is of the Union Station in Tacoma, WA which seems to be uncommon because I can't find anything about this painting. Also just foud the same print cleaning out my Dads house.have u found out anything? Erin_waterbury@yahoo.com..(union station, tacoma washhington. It beautiful! have a painting by paul n norton named misty morn at mystic. how much is it worth? I think I have an original watercolor painting 0f the "OLD CAPITAL" University of Iowa.It has the brown paper on the back of the wooden frame.Does the University of Iowa have a web site.This is a Paul N.Norton watercolor. I too have a Paul Norton water color entitled "Union Station, Tacoma, Wa." I believe it to be a print on water color paper even though there are no 'dots' indicative of reproductions. Is the original water color, 'Seaport Street, Mystic,CN' by Paul N. Norton accounted for? I don't see any dots on the one I'm looking at, but I gather from the other postings the prints done on water color paper don't look like prints. This one is in a wooden frame, brown paper glued on the back, and the stamp of the framer, "THE PICTURE FRAME MAKER" 160 SAXER AVENUE SPRINGFIELD, PA. I would just like to know if the original of this painting is not accounted for, then there's a possibility this may be the original. I have what I think are original watercolors from Paul N. Norton: Tacoma's Union Station; Lake Union Seattle; and Pioneer Square Seattle. All signed. I just took them out of a dusty box where my mom had them before she died. I figured they've been in my family for 46 years. Until I looked him up, I didn't know a thing about him. I cleaned them up and put them in frames and put them up on my walls. I have the same three watercolors...what did you find out about them? I have a print of a watercolor by Paul N. Norton titled "Quarters One" R. I Arsenal. The printing is dated 1976. I am wondering if it is worth. We recently acquired 2 watercolor paintings by Paul N. Norton. One painting is of the U.S. Capital Building and the second painting is of the Lincoln Memorial Building. They appear to be original paintings. Do you have any information as to the value of these paintings? I have what look like 2 original signed Paul Norton pieces, the first is Seafront Street Mystic, Conn the second pieece is entitled Wight's Grist Mill. Any thoughts to whom I might submit these for an appraisal of their worth? Thanks. I think I have an original print of the L.A DUNTON,MYSTIC SEA PORT It looks just like the one on the home page for the web site. My husband found two in the trash. One of which is not signed. Not really worried about the value or selling them. It was interesting though looking up information on this painter. I HAVE A WATER COLOR BY NORTON CALLED SANIBEL ISLAND LIGHTHOUSE. I HAVEN'T SEEN THIS TITLE ANTWHERE. I THINK IT IS AN ORIGINAL. ANYONE BUYING NORTON WATERCOLORS? need to price several for an estate sale, is $100 each watercolor reasonable? need to price several for an estate sale, is $100 reasonable? I believe to have an original watercolor entitled Kakhles Quinlan/His last Visit. It has been with me for many years but I wish to sell it . Do you know of this painting and an idea of the value? My parents wrapped and saved 2 signed Paul N. Norton pictures they got in early '60's. They appear to be watercolors painted on parchment type paper, the pictures are matted and framed in original black, rough hewn wood. One picture is Seaport Street, Mystic CONN. The other is of the U.S Frigate Constellation. Although they don't look "beaded" they may be prints. Anyway, the Frigate is one of the most beautiful of his work that I've seen. I acquired 2 Paul N. Norton high quality, watercolor prints at a local auction for $20.00 each a several years back matted and framed. They were sold at the auction as prints. I got "Old Covered Bridge" and "Wights Grist Mill". I hung them over the sofa. I looked at them daily for months and marveled at how real, how original they looked. I finally got curious enough to research them and I ran across a site in 2006 nortonwatercolors.com that eventually put me in touch with Paul's son John. John confirmed for me via email that my two "paintings" were, in fact, very high quality prints. Many of these were commissioned to be done in Chicago by Franklin and by Desaulneirs in the 1960s and early 1970s. according to John. There are many, many very high quality prints floating around that look very real, even under pretty strong magnification. These prints, matted and framed still do really well. I have a watercolor signed by Paul N. Norton no date or name of subject but is Naples pier before hurricane that destroyed several things in early 1960's. Does anyone know about it? 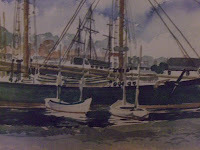 I have a paul Norton painting dated 64. title is Mystic seaport. There is a picture of clam Shack and also Plymouth Cordage Company. Condition is fair. pretty sure it is an original. In frame with brown paper backing. I have a print by Paul Norton.At the bottom of the print its labeled the "Illinois State Capital,Springfield commissioned by Governor Richard B. Ogilvie". On the back it is stamped limited printing Copy no. 785. My mom was given it by a Illinois State Senator whom she work for in the late 60's.Was it usual for the prints to be numbered? I think they were given out to other politician serving that year. If you have any other information I would find it interesting. Thanks! I have four framed signed and numbered prints by Paul Norton. They are of the club house and three different holes on the Rock Island Arsenal golf course. Any idea of value. I have four signed and numbered prints by Paul Norton. They are of the club house and three different holes on the Rock Island Arsenal golf course. Any idea of value? The Paul Norton prints of the Arsenal Golf Club and three holes were issued in 1975. They were relatively inexpensive and offered for sale to the Club membership. If you are looking to sell any of the prints of the golf holes, I may be interested. I have 8 pencil drawing prints by Paul N. Norton commissioned by National Lumberman's Bank in Muskegon Michigan . His son's web site has them listed as St Joseph, MO, but they are actually Muskegon, MI. I understand that framed they are worth $250 to $500 each. Its titled " The Charles W. Morgan"
I have watercolor of the US Coast Guard "Eagle". At the bottom is a comment, "Best wishes to my good friend Fred - Paul" It is signed with a printed, "Paul N. Norton". On the back is a note, "Fred is Fred Schwengel US House of Representatives/Iowa". Below that is another note, "Confirmed from Mrs F.V. Schwengel RR2 Fairfield, IA 515-472-2534". Value? How can you tell an original watercolor from a print? Or what is the best way to determine this? How can one tell the difference between an original and a print? I believe I may have an original of Paul N. Norton's "Belle of Louisville." It was left to me by my 94 year old friend several years ago. Unframed, it is rolled in a tube. How much should I ask for it? Is anyone interested in purchasing it? he may have painted more than one original. I have the same painting. it is definitely an original. I just purchased a Paul N. Norton water color of the Iowa Governor's mansion, Terrace Hill, that is signed by Governor Robert D. Ray and Billie Ray. Of course it is also signed by Paul N. Norton. There are no dots or brown paper. Any estimate of it's value?? I have 3 Paul N Norton pencil drawing prints that I purchased at a local auction. They were part of a box lot. They were unframed, and I have since put them in some inexpensive frames. One is of a Lincoln moment/statue, one is of Hackley School, and the other is of Hackley Art Gallery! All are 11 x 14 in size on white paper. All are signed but not numbered. I have a watercolor signed Paul N Norton of the Tetons. It is on watercolor paper and looks authentic but could be a signed print. I haven't seen any posts of him doing mountains, so am curious if he visited Wy and then painted the Tetons. Can you tell me if you ever knew of him painting the Tetons? Paul Norton painting of VanderVeer Park Davenport, Iowa. Awesome frame. Looks like an original. Anyone know more about it? I have two Paul norton pictures matted and framed. One of the 17th hole and other of golf course. Anyone know what they are worth. My Paul Norton watercolor is titled "The Tetons". It appears to be an original, but I am not 100 percent positive. It wasn't framed so I had it framed and I love it whether its an original or not. When did he paint in Wyoming? There is very limited information available for Paul N Norton - so I'm not sure - if you ever find out please do share. I have a Paul N Norton picture of a house with a white picket fence and a tall lamp light in picture, it looks like water color and have the brown paper on the back. Just wondering if it is worth any thing. I have a watercolor, not framed, of the CB&Q Station in Rock Island IL. It is an original. Hi there, I have a Paul N. Norton print called "Misty Morn at Mystic" I was wondering if anyone knew what the value of this print would be? Prints go for as low as $10 unframed, framed (based on the frame condition) can be $50 or ever $80-$100. For the pricing of the original watercolors contact your local art galleries and see if they will be willing to appraise it for you. I have some guidelines in the post above but having them appraised at a gallery is the best way to find out what they actually worth. I have 3 Paul N. Norton watercolor prints / originals. It is numbered in pencil on the back. Anyone else have one that is numbered? Been searching forever and have found nothing. Normally prints are numbered when they are part of the limited edition prints- the first number indicates the what number print it is in the series and the second is the total number of prints. For example - 20/100 - means 20th print out of 100 total. The first print in limited edition series worth more than others - but limited edition prints worth more in general since once all of the are sold (like 100 in the example above) no more prints like that will ever be produced. In an open edition unlimited amount of prints can be produced. I'm interested in using a Paul Norton watercolor image for a book cover, and I'm wondering how to go about acquiring permission to do so. I interested in knowing whom I should contact about the cost involved. If someone could lead me in the right direction, I'd appreciate it. Thank you. B. T. Warren . The copyrights rules for Art are somewhat complex - usually heirs will inherit them. All the prints that I have seen so far are very old- the best bet is to try to contact whoever produced those prints if they still around and find out who holds to copyright to the originals. This can be long and time consuming process - so good luck. I have the original but prints are worth about 400 each. I have what I think is a signed framed original of 'The Horse' does anyone know how much this would be worth? The post above provides some guidelines- however its all about how much people are willing to pay for it. Best approach if to visit a few local art galleries and see if they can appraise it for you. I have an original watercolor of Niagara Falls by Paul N Norton in excellent condition that was found last day of an estate sale. I paid $25 because I enjoyed it. Other than that, what is its value? I purchased an original watercolor of Niagara Falls by Paul N. Norton. I found it at an estate sale and feel it is worth my $25 for enjoyment. Past that, can you tell me the actual value. A handwritten note on some of the backing shows it was given to the owner as a retirement gift from the local newspaper that employed this person in 1988.
again I think I have an original Paul Norton water color of the "Steamboat Delta Queen" and was wondering its value ? Thank You for all you comments - please keep in mind I'm not an appraisal. The article provided some general guidelines in terms of a value other than that the idea is that you can share your information here - what you have, how much you paid for, etc... so then this will help future readers to get a better idea of what their watercolor worth. What are the standard canvas sizes? Exhibit or exhibition – what is what and what is right? Standard frame sizes - is there a such thing?